The red line shows the the percentage of emergency department visits caused by flu-like illness in New Jersey through the week ending Jan. 20. Last week was another tough one for the flu in Pennsylvania and New Jersey, and just about the entire nation. According to the Centers for Disease Control and Prevention, all but one state — Hawaii — were still reporting that flu cases were geographically widespread. Most states, including New Jersey and Pennsylvania, were also reporting high numbers of cases. READ MORE: Flu isn't the only virus making us sick this season. Weekly flu surveillance reports from the New Jersey and Pennsylvania health departments show spikes in flu activity during the week ended Jan. 20 after some leveling off the previous week. Reports on flu are not precise, but public health officials try to capture trends in visits to doctors and emergency departments as well as hospitalizations and deaths. The only thing that dropped in New Jersey was school absenteeism. In Pennsylvania, all measures of flu continued to rise. Philadelphia reported significant increases in all age groups. 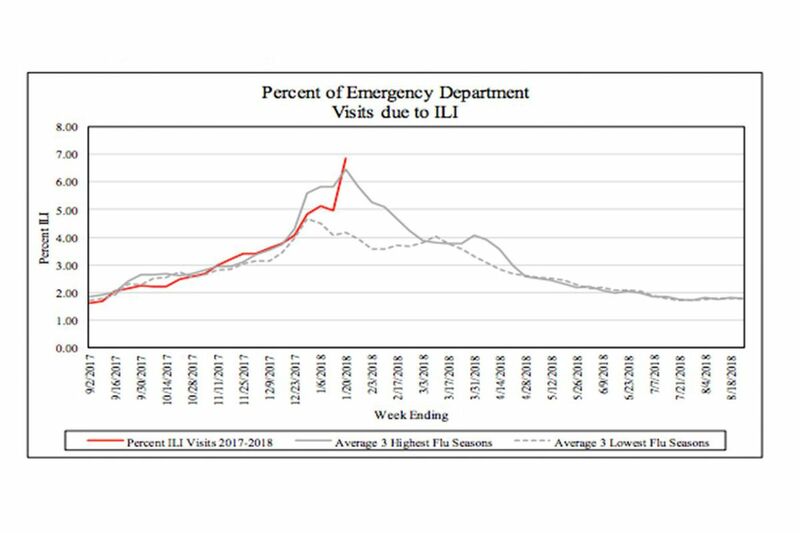 The red line shows the percentage of emergency department visits caused by flulike illness in New Jersey through the week ending Jan. 20. There have been reports from as nearby as the Lehigh Valley of hospitals straining to provide care for crowds of flu sufferers, and even putting up tents to keep patients from infecting others. But Philadelphia-area health care providers and public health officials said they had not heard of similar problems here. Peggy Leone, a spokeswoman for the Virtua Health System in New Jersey, said the system's emergency departments are full and it has added staff to handle the patient volume. The hospitals are separating people with flu symptoms from other emergency patients. Pennsylvania reported a total of 47 deaths, including one child. New Jersey, which only reports pediatric deaths, said one child has died this season. READ MORE: 1,200 Philadelphians died in the flu pandemic of 1918; this writer's aunt was among them. Nationally, the CDC says 37 children have died and 12,000 people have been hospitalized with pneumonia or flu. Dan Jernigan, director of the CDC's influenza division, likened this year's flu season to the one in 2014-15, when a Type A H3N2 also was the predominant strain. H3N2 viruses tend to cause more severe illness and are better than other types of flu at evading vaccines. Other strains of flu are also circulating. Philadelphia reported a sharp increase in influenza B.
Hospitalizations this year have been most common in people over 65, but it's been a tougher-than-usual year for those 50 to 64. The CDC estimates that 34 million Americans will catch the flu this season. An average flu season lasts 16 weeks. The country is in Week 9. Experts say it's worthwhile to get a flu shot, even though it is far from 100 percent effective. The vaccine takes a couple of weeks to reach full effectiveness.